“Which size should I get for my Canada Goose parka?” We often get asked what size Canada Goose is the right one. It’s a great question and it depends on a few factors. Beyond your personal preference, there’s your body size. Below you can find a sizing chart which indicates the measurements for your body and is sure to help the choosing process. These measurements don’t necessarily take into account the fit of the separate parkas although Canada Goose does design their parkas within three fit types: slim, regular and relaxed. Below are short descriptions of each style with the sizing charts organized by fit so you can easily find which one is right for you. You’ll find that these are tighter than the average fit you’re used to wearing. If you like a fit that’s very close to the body, this one’s for you. If you are debating between two sizes, you should consider the larger of the two. You’ll find that these have a pretty average fit, if slightly looser than most. You should simply get your normal size. Those who want it close to the body should be careful because ordering a size too small will mean sleeves that are too short. Relaxed in this case is an understatement. They are very loose. Perhaps the loosest you’ll ever wear in the corresponding size. This extra room has a function. In the coldest environments, on the coldest days, you’ll want to be able to add some layers. The looseness allows just that; it means you can easily add a good 10°C – 15°C to your jacket. 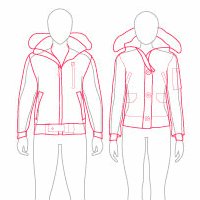 Despite the looseness, the jacket is still made for the body indicated in the sizing chart. If you are debating between two sizes, feel free to order the smaller one. If you are looking to downsize more than one size for a trimmer fit, you should think about getting another model. If you have any questions, please let us know in the comment section or you can read our choosing the right winter jacket guide for some further tips on finding your ideal winter coat and the perfect fit. There is 149 thoughts on this article titled “Find Out Which Canada Goose Fit Is Best For Your Body”. I need a coat that is temp 4 that is not bulky.I have tried on the Trillumion but the large is too big on shoulders and the medium is tight in stomach area. would the Rowley be better fit? Hi Dana, the Rowley is actually slim fit whereas the Trillium is a regular fit so you may find the shoulder to be less large in the Rowley.Because it is a slim fit, you may encounter the same problem with it being tight in the stomach like the trillium but the large may be a good option. It’s always best to refer to the measurements in the size chart as they will be the most accurate and if you order two, we have a great hassle-free returns system. If you’re a lifetime member, you even get free returns. Hi Kelsey – I am interested in the Mens Macmillian black label parka. I tried it on a few months ago in store and was slightly confused with the sizing. I am 6ft and 185 pounds and find the medium to look the best but find it tight in the upper body especially under the arms where it rides into the armpits. The large fits the upper body much better but looks not as fitted with long arms and looks like a bulkier coat overall. I’m pretty sure you couldn’t layer under the medium comfortably but as its a slim fit I know its supposed to fit close to the body but how close exactly ? I have a langford in Medium and it fits fine which is also slim fit. Any feedback would be greatly appreciated. Hi Dan, because the MacMillan is a slim fit, it’s no surprise it may feel tight under the arms. In this situation, if you 100% want to stick with the MacMillan it will be a decision with whether you prefer a comfortable fit or a more flattering look although I would suggest going for the more comfortable fit. It is also possible it was just the model you tried on and there may have been a slight defect within the design. The Carson is quite a similar look and so is the Emory (with fur on the hood) so it may be worth trying different models to see how the fit varies. someone I know is selling a expedition coat and it may be female, what’s the difference in that coat for both genders? Also in terms of sizing, I’m 5’8 and weigh 145lbs. Is a Small a better fit? Hey Richard, there are a few different styles of the Expedition so it’d be good to figure out which style they are selling whether it be regular, Fusion fit or the Polar Bear International Expedition. Each may differ in size slightly and the fusion will fit smaller than the regular. If you’re looking for the best size for you, I’d suggest referring to the measurements in the size chart, this will give you the most accurate answer. Have some overweight, 5‘9 with 200lbs. Normally I have not that much of a problem finding jackets. But CG is different. The majority is slim. Any recommendations for a parka? Tried the chateau in XL. Length is ok but the slim fit is way to tight. Is XXL much longer? Don’t like the Constable and the others are TEI5 which is too much for my region. Hello Martin, Canada Goose does carry some models that are more of a relaxed fit. 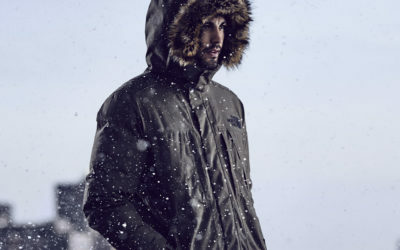 These models include the Expedition Parka, the Polar Bear International Expedition Parka, the Resolute Parka as well as the Snow Mantra, all except the Snow Mantra are currently in stock available in XL. You could also try one of the regular fitting parkas which include the Borden Bomber or Chilliwack Bomber, both of which are available in XL and XXL options. Kelsey, thanks for your advice. Will follow your suggestion. Hi, I am looking at Emory men’s parka, cannot decide the size. I am 175cm, waist 30-31, weight about 158lbs. Should I go for small or med ? Hello Timo, I would go for the medium to avoid a fit that is too small as you are on the cusp of the small sizing measurements. If ever in doubt, order both and take advantage of our hassle-free returns. Hi any chance you might have Admiral Blue in Medium soon? Its out of stock now. Hello Timo, we are expecting some new stock to arrive soon so stay tuned to the website. Hi I just realised that Banff has the admiral blue in size M, but fusion fit…would that fit me? Hi Timo, Fusion Fit models generally have smaller chest measurements and slightly bigger waist sizes. There is no difference however between the hip measurements for both sizing types. If you refer to the measurements in the sizing chart, you’ll be able to see whether this will work for you.